Dr. Darrin Griffin, assistant professor of communication studies at UA, speaks to local law enforcement officers learn etiquette and proper methods for communicating with deaf citizens. 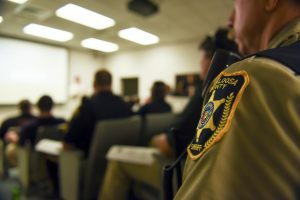 TUSCALOOSA, Ala. — As nearly 20 law enforcement officers from across four different agencies sat in a theatre-style room Tuesday at The University of Alabama, all but one revealed an interaction that surprised workshop organizers Dr. Darrin Griffin and Erin Powell. 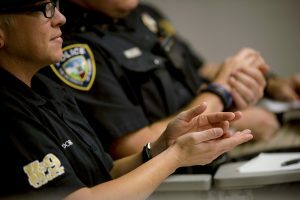 Nearly all of the officers said they’d had a previous interaction with a person who was deaf or hard of hearing while on duty. While officers provided anecdotes about their experiences, Griffin and Powell, who organized and held the workshop for interacting with members of the Deaf community, were able to provide context to some of the misunderstandings during those interactions, an overview of civil rights as they relate to people who are deaf or hard of hearing, and teach the officers 10 basic signs that could be applied during future interactions. 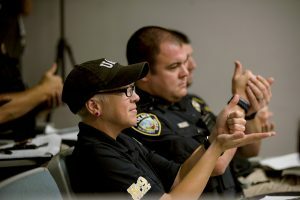 Officers learned basic signs previously recommended by people who are deaf or hard of hearing, like “I’m deaf” or “step out of the car.” Officers also learned how the nuances of communicating with deaf citizens can either enhance or weaken the interaction, depending on the officer’s knowledge. 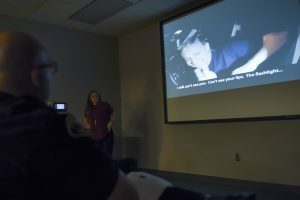 For instance, when an officer approaches a car during a traffic stop and shines their flashlight at the driver’s side window, a deaf person’s reaction may be interpreted as panicking, but, not because they’re concealing anything, but because the bright light prevents them from seeing – the channel of communication for the Deaf. 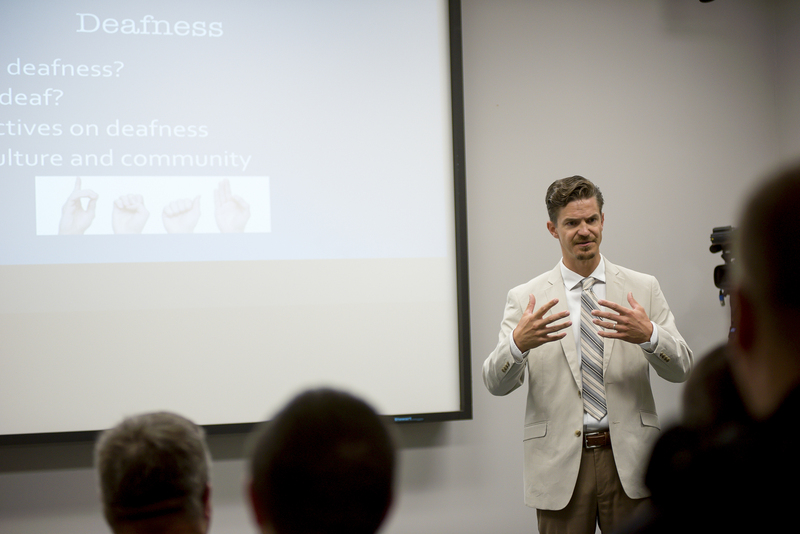 Still, reading lips might not be enough for a deaf person to communicate during that interaction. Griffin said that only one-third of spoken word can be understood through lip-reading. 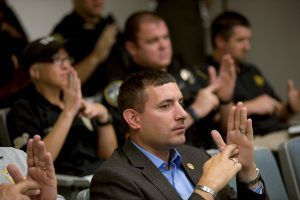 Additionally, close to 50 percent of deaf people have another disability that may further complicate communication with an officer. 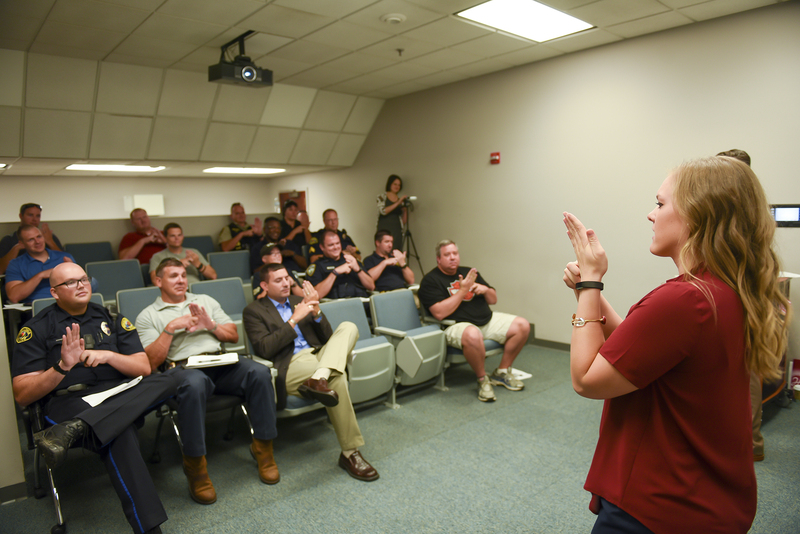 Powell, an interpreter and adjunct professor who teaches American Sign Language in UA’s Honors College, said she’s only been approached once about providing training, in part because people and organizations don’t know where to find resources. The workshop was prompted, in part, after a recent incident in which a man in North Carolina was shot and killed by a state trooper after a traffic stop and brief chase. Powell and Griffin discussed six different incidents Tuesday in which citizens were abused or mistreated by police, leading to civil suits. 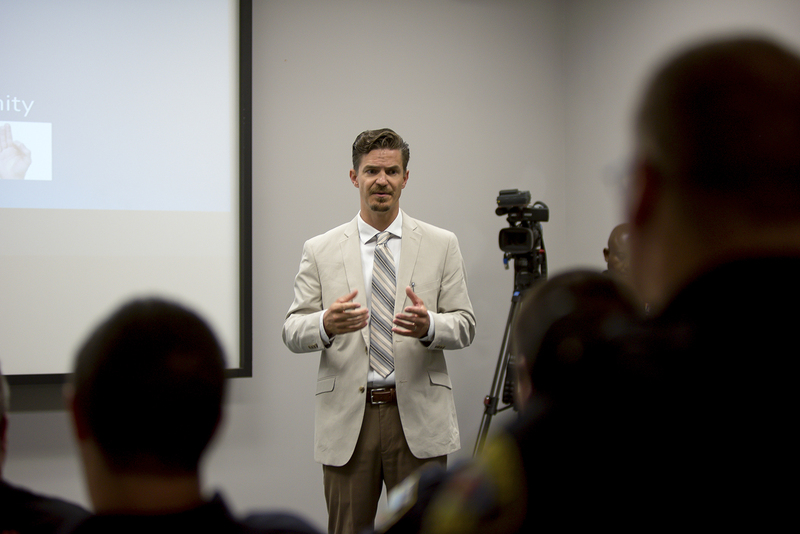 Dr. Darrin Griffin, assistant professor of communication studies at UA, speaks to local law enforcement officers who are learning etiquette and proper methods for communicating with deaf citizens. 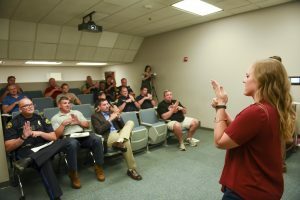 Local law enforcement officers learn etiquette and proper methods for communicating with deaf citizens. Local law enforcement officers practice basic signs that can be used during interactions with the Deaf or hard of hearing.